Scientific evidence refuting the theory of modern humanity’s African genesis is common knowledge among those familiar with the most recent scientific papers on the human Genome, Mitochondrial DNA and Y-chromosomes. Regrettably, within mainstream press and academia circles, there seems to be a deliberate vacuum when it comes to reporting news of these recent studies and their obvious implications. Australian historian Greg Jefferys explains that, "The whole ‘Out of Africa’ myth has its roots in the mainstream academic campaign in the 1990′s to remove the concept of Race. When I did my degree they all spent a lot of time on the ‘Out of Africa’ thing but it’s been completely disproved by genetics. Mainstream still hold on to it." The academics most responsible for cementing both the Out-of Africa theory and the complementary common ancestral African mother – given the name of “Eve” – in the public arena and nearly every curriculum, were Professors Alan C. Wilson and Rebecca L. Cann. Central to results of this extensive examination of haplogroups (7,556) was the absence of any African genes. 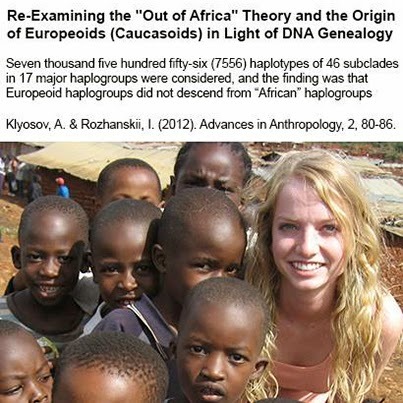 So lacking was the sampling of African genetic involvement, the researchers stated in their introduction that, “the finding that the Europeoid haplogroups did not descend from “African” haplogroups A or B is supported by the fact that bearers of the Europeoid, as well as all non-African groups do not carry either SNI’s M91, P97, M31, P82, M23, M114, P262”. With the haplogroups not present in any African genes and an absence of dozens of African genetic markers, it is very difficult nigh on impossible to sustain any link to Africa. The researchers are adamant that their extensive study “offers evidence to re-examine the validity of the Out-of-Africa concept”. They see no genetic proof substantiating an African precedence in the Homo sapien tree, and maintain that “a more plausible interpretation might have been that both current Africans and non-Africans descended separately from a more ancient common ancestor”. We regard the claim of “a more plausible explanation” as a gross understatement, since there is absolutely nothing plausibly African turning up in any test tubes. In fact, the researchers made note of their repeated absence stating “not one non-African participant out of more than 400 individuals in the Project tested positive to any of thirteen ‘African’ sub-clades of haplogroup A”. 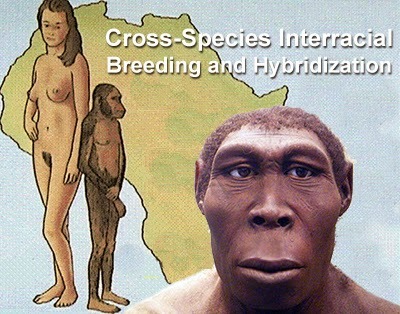 The only remaining uncertainty relates to the identity of this “more ancient common ancestor”. All that can be stated with confidence is that humanity’s ancestor did not reside in Africa. Unfounded accusations of racism have become common as the prevailing Afrocentric hypothesis is constantly being challenged by the growing mountain of conflicting scientific evidence, especially in the evolving field of genetics. The Domestic dog (Canis lupus familiaris) is a sub-species of the gray wolf (Canis lupus), and they produce hybrids. There are numerous other examples of where two separate species can also produce viable offspring, yet are considered separate species. That said, humanity has been shown to be, genetically speaking, a hybrid species that did not all share the same hunter-gatherer ancestry in Africa. Recent sequencing of ancient genomes suggests that interbreeding went on between the members of several ancient human-like groups more than 30,000 years ago, including an as-yet unknown human ancestor. "there were many hominid populations,” says Mark Thomas, evolutionary geneticist at UCL.